The culinary caliber of buffets reaches its highest limit at Le Village Buffet. This buffet offers made to order selections prepared in different venues simulating provinces throughout France. Dining in a small courtyard fashioned after a town square or inside next to a cozy fireplace your meal will be fresh, authentic and delicious. Stroll to the salad bar, crepe station, carving station, or the bread & cheese station to fill your plate with exciting, delectable fresh selections. 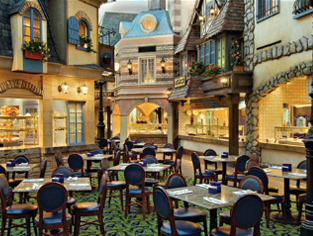 Feast, imbibe and relax in the ultimate French fashion at Le Village Buffet. An all-you-care-to-drink special includes draft Blue Moon or Miller Lite beer, house red and white wine or Bloody Marys for $12.99. Food was decent. I bought the 24 hrs food pass so it was worth it. The vegetables were pretty good. Loved the food, atmosphere, and price! Can’t wait to go back! While on here reading reviews I decided to take a chance, and like most chances in Vegas I lost… The buffet may have been on the cheaper side but the selection was awful, I didn’t come to Vegas to get let down on cheap quality food either. These are plenty of other choices, pick one of those! favorite! wish I could have gone again! Not only is this restaurant cute with the scene of eating outside and visiting the different shops for your food. But the food was so good! My favorite: the best crepes, crab was already cut in half, creme brulee! Yum! Really wish we could have made it back but if we do go back to Vegas this is the top of the list! Enjoyed the food for breakfast so much that we went back later the same day for dinner. Best creeps I have ever had. Also the custard was delicious. The breakfast is the best! We love it and the waitstaff is wonderful! I love this buffet for breakfast. Hard to beat the price, even without a comp. No matter where I stay on the strip, it worth the walk for breakfast!! This buffet used to be one of the best in Vegas, IMHO. It is still good if you have a coupon or comp. Other buffets have passed it by for me to pay full price! But still good quality food.